Over the hills and through the desert to grandparents’ house we go … Today’s guest post by my ma, Linda, gives you a peek into how my children will spend Thanksgiving day. How do rituals work into your Turkey Day celebrations? Happy feasting, everyone! 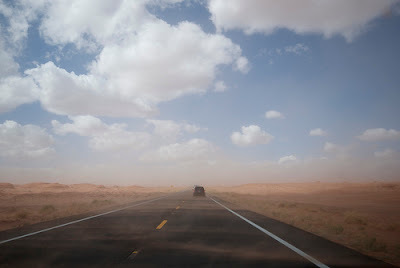 The minivan pulls into the circular dirt driveway, stopping as a cloud of dust covers the car. Doors fly open and four eager grandchildren run to our front door, thrilled to begin their visit at Nana and Opa’s. First they check out the chickens. Running to the backyard and opening the door to the hen house, they search for the prized egg. Over the years the number of chickens decreased until we now have one lonely hen. I think she anticipates their visits too so she can show off her hard work to exclamations of delight. Then they move on to Bailey, our dog, who lives in a pen east of our front door and is always eager for a walk. With the purple leash in hand, the tug-of-war begins, all signs of control lost in the struggle. Moving into the house, they pour over the children’s book shelves, searching for their favorite books, many of which their mother discovered when she was little. Recently, we packed away most of our books to do a home-improvement project, and when they came to visit they couldn’t find their favorite titles and felt concerned that I donated them to the thrift store. Not to worry! The books are now back on the shelves waiting for their next visit. These shabby books barely survived our six children and now our grandchildren are leaving their fingerprints on the well-worn pages. Fur family. Courtesy of Linda Conlin. Chaja has a collection of wooden dolls — similar to paper dolls — which she keeps in a metal tin in my office. She also cherishes a spiral basket made in Mexico which holds a couple families of little animals with tiny pants, shirts and dresses. Even though she doesn’t always play with them, she never forgets to check on them, making sure they are where they belong. Max and Sam are eager to try out the games, which we house on a shelf in the hallway above the washer and dryer. They climb up on the machines and pull out a game of Battleship. They stage war on our high bed, towering above Ivan’s grabby little hands. For days after, I find tokens of their battle — little white pegs hiding in various places throughout the house. As time passes, they plea for their favorite adventure — driving the Volkswagen. Sitting on Opa’s lap with hands clutching the steering wheel, Max careens about the alkali flat, leaving a plume of dust in his wake. Mario Andretti has nothing on this race car driver! Sam and Opa on top of the world. Courtesy of Linda Conlin. 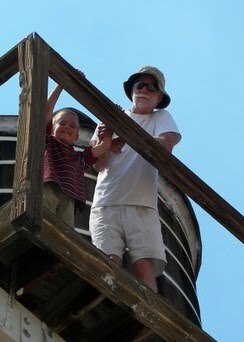 Once, when they had solo visits to our home, they got to climb the windmill tower with their Opa. Sitting side-by-side on top of the world, they had a bird’s-eye view of the valley below. It reminded me of my own kids — challenging one another to climb the tower and sit on the platform as the earth continued spinning far below. After we wash and put away the dinner dishes, daylight eases into dusk and they put on their pajamas. That’s when the search begins — shoes, sweaters, hats, books, toys — all must be tracked down and all must be packed up. After hugs and kisses goodbye, they line up and climb back into their van, tired from a day of playing and exploring. The van pulls away and we sink into the couch, breathing in the solace of a home, quiet once again, and the sweet memories of a day with our grandchildren. 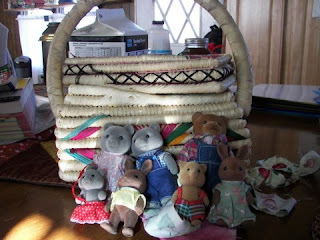 Linda Conlin blogs at The Nevada Piecemaker and is a contributor to The Quilting Bees and River Wranglers.